Rafał Mokrzycki is a Polish pianist. He is a winner of the Valletta International Piano Competition in Valletta, Malta, 2017. He was rewarded on many other national and international competitions: International Academic Music Competition in Jurmala, Latvia, 2014, Szymanowski In Memoriam Piano Competition in Warsaw, Poland, 2009 and West-Pomeranian Piano Competition in Szczecin, Poland, 2009. He was also a semifinalist of Jeunesses International Music Competition in Bucharest, Romania and Brahms Wettbewerb in Pörtschach, Austria. He was a scholar of Karol Szymanowski Foundation and National Fund for Children. He graduated with distinction from Zenon Brzewski Music School in Warsaw, having worked with Elżbieta Karaś-Krasztel. He graduated from Fryderyk Chopin University of Music in Warsaw, where he had studied in the piano class of Prof. Jerzy Sterczyński, as well as in the chamber music classes of Prof. Barbara Halska and Prof. Katarzyna Jankowska-Borzykowska. He is currently doing his postgraduate studies at Vienna University for Music and Performing Arts with Prof. Avedis Kouyoumdjian. He participated in numerous masterclasses led by renowned pianists such as Pavel Gililov, Boris Berman, Eugen Indjic, Edward Auer, David Dolan, Gottlieb Wallisch and Christine Schornsheim. 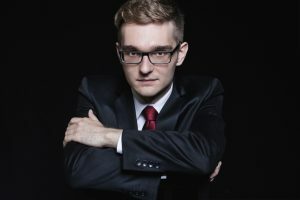 He performed as a soloist and chamber musician in many concert halls in Warsaw, as well as in National Forum of Music in Wrocław, Poland, Opole Philharmonic, Poland and Lviv Philharmonic, Ukraine. He was invited to play in numerous international festivals i.e. Valletta Piano Festival in Malta, Gulangyu Polish Music Week in Summer in China, Sacrum non Profanum in Trzęsacz, Poland. He performed in many European countries, such as Austria, Germany, Slovakia, Latvia, Ukraine, Malta, Turkey and Romania, as well as in China. His wide repertoire includes works from baroque to the present time.